Can you see us all? in due order is closely related to play and good worker in the fact that they function as a triangle. The approach in good worker was that of a duality and I was saying that it portrayed a metaphorical discourse between body and mind. If anything, play is showing us where body is going and in due order is showing us where mind has gone at the end of good worker. Imagine the rooms in play and in due order one above the other. It’s quite obvious, since they’re visually connected via a set of stairs. Many have noticed it. These two rooms can easily portray the two sides of the human brain. 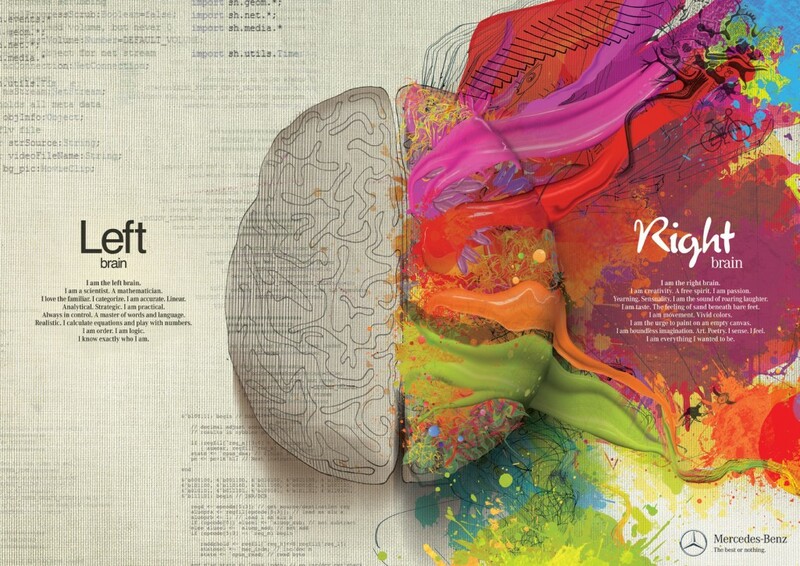 Play would be the right side – colored, uncontrollable, chaotic, sensual, passionate, boundless. In due order would be the left side – as the name itself says, always controlled, perfectly synched, a mathematician, very logical, linear, always categorizing things. It’s easy to detect images suggesting this. Everything is perfectly aligned, there’s great use of squared objects (windows, the ikea shelves), the choreography is balanced, movements are on 8 beats, what’s done in the first four is immediately balanced on the next four. The music follows a perfect order itself. The clumps and MO are in due order as well even if there’s an appearance they’re not. As opposed to play, where they were dancing on their own, each on his own beat, clumps are now controlled, synched, they follow predetermined steps, they’re obeying the beat. MO is always aware of her movements, eyes always on the camera, even when the camera moves in different angles, MO is still following and still creates perfectly balanced images with her body. Her outfit is perfect as well. Split her in half vertically and you’d get two perfect sides. I think it’s more than eloquent to sustain the idea above. Compare how hair looks in play and in due order and there you have it. It’s a nice way of portraying creativity and the process of conception. An idea/art is created in the same way as a human is created. A process of ‘fecundation’. Spermatozoa gathering around the ovary with the final purpose of birth. 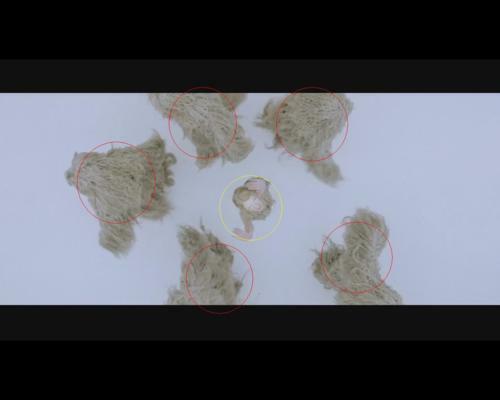 The two images side by side tell us how things work inside iamamiwhoami. From a scientific point of view. Because, of course, things in iamamiwhoami could also work as choreography goes in play. Totally random, yet part of the creativity process. The 5X5 ikea shelves at the end of the video is, again, another sign of order. It’s a perfect shape. In numerology, 5 is the number of harmony and balance. Five is the first of digits that is in a constant state of balancing its own equation. Greeks held the number five as a representation of dispensing spiritual knowledge and considered it a vehicle for gaining proper spiritual understanding. The shelves are empty because they’re waiting for information to be categorized. Not much else can be said about in due order. I could easily go into speaking about how the lyrics address who, but it’s quite obvious. I recommend you also read 2020k’s audio analysis of the track because it’s done beautifully. Find it here. There are some bits missing, but, as expected, we’re in the field we were left in at the end of good worker. We can only assume Clump has dragged MO up to the road and now he’s releasing her, removing the white cloth that was keeping her imprisoned. Of course, I immediately think of a straightjacket a mentally deranged person wears during treatment, to prevent harming itself. Clump pushes MO away, the latter turns towards him, reluctant, he gives her a ‘go on, you’re on your own, go!’ gesture and she leaves. Notice the motion is still from right to left, she’s still traveling back (or maybe deeper under – the audio behind these images really comes to sustain this idea). To me, the fact that she’s not fully dressed in the Clump suit, but only wearing it on her shoulders sounds like a wolf dressed into a sheep. It appears that the only way to travel on this level of consciousness, you have to become a part of it, look like the things ‘inhabiting’ it. Thus the suit becomes a means of protection. I cannot omit mentioning that it reminds me of the knight suit CU wears in Y. As we move forward, we can see MO cutting the field, looking back from time to time. She doesn’t appear to know where she’s going, she just know she’s moving closer to something. We can now notice that she carries a golf club in her hand. It’s an instrument, just like the sword in drops. But what is it for? She first drags it along, then she uses it as a cane, then she uses it to test the field, after which she knows what it is and ‘bats’ it, as if ready to hit the ball, and in the end, she points it towards the sky. An elongation of her hand. It’s the sky she wants to reach (it was the sky she was aiming at during good worker as well). Which is funny, because when we think of golf, we think of holes in the ground. One interesting thing: is it a coincidence that the golf club looks like the musical symbol for a note? I don’t think so. And the track being called play? This might as well be a confession of iam’s love for music. A statement that through music you are enabled to reach certain levels of the self, why not. I’m saying this because in the next images, she’s using the club as a cane, wearing it reversed (still looks like a note). If you want, it also looks like an I. Which I don’t think it’s a coincidence either. Due to the presence of heavy, cloudy weather and lightning in the distance, and the fact that MO points the metal golf club towards the sky, there’s a general belief that she desires to be struck by lightning. There are no clear images to suggest this, but the way she looks in the following footage could imply that it has happened. A violent enlightenment? Next images show MO in a dark place which reminds us of the barn in the last pre-video and the hut in O. She’s standing in an open door, light strobes hitting her face from time to time, just like lightnings. Is she home? Has she made it to the place she’s been traveling towards ever since sever? She does look like she’s comfortable here and she appears to be the mistress of the house, her posture and moves speak so. In the middle of this wooden room, a familiar figure: the Clump creature. He’s everywhere she goes! And he appears to be happy to see her now, look at him shaking it! I remember when we first saw the five Clump creatures at the end of drops, we were hoping for a dancing spree and here we have it, finally, exactly how we imagined it. It appears that dance has a particular meaning with iamamiwhoami. I am thinking communion and letting go of the body and mind, setting both of them into motion and harmonizing them with the beat of music and the kinetics of other dancers. The thing I have noticed about this special dance in play is that it’s a little bit chaotic towards the end. If you look at the beginning of the second stanza, MO tries to make the Clump synchronize its moves to hers. See how she moves her arms and legs when she sings so I will run now, run now. She tries to keep it organized (keep her mind, thoughts, imagination organized, have control upon them), she even tries to impose some choreography, as opposed to the dance in sever, she’s the one leading now, she closes her eyes and continues dancing with him. What she didn’t expect was for him to start multiplying again. She doesn’t open her eyes until she’s hit by one of the clumps, she doesn’t notice things getting out of control. While she lets her body and mind loose, something else is being unleashed as well, five times more powerful. Those Clumps really are unpredictable and each moves at its own will now, each on his own beat and style. Towards the end, MO does not feel she can keep pace, she doesn’t like the chaos around her (she just sees it), she’s overwhelmed, the clumps have become so many and so independent they don’t even take notice she’s among them anymore and they hit her while they dance, they have the potential to hurt her. That’s the individual losing control of his mind. The hit in the head is a wake up call, a moment of lucidity in a deranged person’s mind, the moment she realizes that what is going on is not right, things are out of control, too many uncoordinated dancers, the floor is unbalanced. Maybe this deep dark barn is not the place to be in either. This is not home and she’s not one of the clumps. So she leaves the dance floor and retreats into the shade, her eyes, wide open and aware now, seeking for an exit once again. I cannot deny this is a very sexual track. I knew it would be something special ever since the sample has emerged. I do not know whether this is a collaboration with other another artist or not (probably not), I just know that the shift iamamiwhoami has taken with play is good news. Can’t help but wonder what’s installed for us next. Again, I have to mention that for me, the fact that the videos go from light to dark and the covers go from dark to light is a sign of self discovery. Diving deep within to discover one’s iamness. It’s better not to know so much about what things mean or how they might be interpreted or you’ll be too afraid to let things keep happening. Psychology destroys the mystery, this kind of magic quality. It can be reduced to certain neuroses or certain things, and since it is now named and defined, it’s lost its mystery and the potential for a vast, infinite experience. I partially agree with It’s better not to know so much about what things mean or how they might be interpreted. I think that if I replaced ‘know’ with something else, the meaning of his statement would become invalid. It’s not that you have to know what they mean when someone already knows (! if) and they share it. It’s what it means for you and how you interpret it that matters. These things cannot be avoided. Everything the eye sees, the brain processes, therefore everything has a meaning. Lack of meaning means something too! Whatever I am doing in these posts on forsakenorder.com is not intended to make the mystery and magic dissolve. It’s just how I see things at one point. I am totally for infinite experience. Anyway, it’s this feeling I’ve been having with the kin series, I don’t particularly want to write an article immediately when a video appears. Sometimes I fight myself to do it. I think this cookie crumbles just the right way and at a right speed. The experiencing of their music is becoming richer and more savory. Shall we let music take over? Sure… but it’ll never be just about music with iamamiwhoami, will it? Read 2020k’s wonderful audio analysis of play here.